The Strategy of SHEC is formulated from the result of the use of the different tools like the SWOT (Strength, Weakness, Opportunity and Threat) desired community indicators, levels of community empowerment. It will be delineated in the form of the VIMOKRAPISPATRES (VIsion-Mission, Objectives, Key Result Areas, Performance Indicators, Strategies, Programs, Activities, Tasks, REsourceS). In the SWOT analysis, the internal and external environments of SHEC are analyzed according to the interrelations of their Strengths, Weaknesses, Opportunities and Threats. The results are, then, derived. In order to know the direction of the results of analysis, the desired community indicators are used. Such indicators determine the level of the different phases. All of which have been presented in the previous chapters. In this chapter, the strategies are developed from the analysis of the levels of the different SHHOAs and of SHEC. These are presented logically with the use of the instrument, VIMOKRAPISPATRES.� The logical framework will not used in this paper. However, some of its components will be incorporated in the present instrument like the assumptions and risks. ����������� The strategies of SHEC are divided into three: 1) for the SHHOAs, 2) for the stakeholders, 3) for the internal environment of SHEC. However, the Vision-Mission has to be stated first. Then, the different strategies follow together with the plan of action, monitoring, assumptions and risks mitigation. A community of Spirit-led persons desiring to follow Jesus Christ in his proclamation of the Kingdom of God and in his union with God the Father with St. Hannibal as model and Mary as guide. Since there are five different levels of the SHHOAs, five corresponding yet related strategies are also formulated. Incidentally, they all start with the letter S for facility in remembering the terms. But more than this, the terms chosen are actually derived from the vision-mission of SHEC. They summarize what SHEC means by empowering the different SHHOAs. �1st � Setting off means getting to know the people more closely, learning from them, giving them the overview of the learning relationship, introducing them the skills, knowledge, attitudes that they need to acquire and develop along the way, preparing them to be aware of the presence of God in their lives and the ways to get closer to God. This is what SHEC really does in beginning to empower the people. The objective of this strategy is primarily to know the people, to establish relationship with them, to introduce them what will happen in the following moments of engagement and most of all, to introduce them to God. The secondary objective is to let them come to realize their stake in the process of development. The indicators can be seen in the brief knowledge generated in meeting with the people, in the having spontaneity in dealing with the people. Likewise, their interest in prayer also manifests their desire to be in communion with God. Finally, their willingness to collaborate in the future undertaking is a concrete manifestation of their openness to a joint development process. The activities that can be taken are the following: going around the different areas and befriending the people, joining the people in their social gatherings and partaking in their religious activities. These can be done by the staff and other personnel of SHEC in order to establish the desired relationship. This strategy of setting off enflames the mood of active participation and collaboration of two parties in the joint venture of comprehensive community development as well as the full growth of the SHHOAs. �2nd � Striving means making the people move by themselves and not to depend on others, inspiring them to get deeper in their knowledge, skills and attitude about their own concerns and the values developed by them. Again, SHEC deems it necessary to let people strive hard and not simply become idle even though they are the poorest of the poor. At this point, the objectives are as follows: to know the prayer what Jesus taught especially silent prayer, to be familiar with the prayer for vocations, to get to know Mary Mother of Jesus, to have a deeper knowledge about St. Hannibal and� the kingdom of God, to have started with the programs on housing, savings mobilization, livelihood and values formation. For the leaders, the following are necessary: to have a deeper knowledge about the elements of an organization, to develop the skills of facilitation and of managing their own organization. Having all these things, it is expected that they should have developed their relationship with other members and leaders in their own association. Furthermore, it is also expected that they can already lead their own groups to a certain degree, share their learning in organizing and leadership training. Finally, they should have started the processing of their land and housing programs as well their livelihood undertakings. The indicators are the practices of silent prayers, meditation, and recitation of the rosaries, mass attendance, regular meetings and consultations. The documents of the housing programs are already in their hands. The leaders can already facilitate in meetings. They can also take charge in gatherings and other big events.� The activities which can be undertaken are the following: regular meditations, prayers, conferences, trainings, sessions and conferences. �3rd � Savoring means giving value to what they are doing, receiving from others in the form of knowledge-sharing and experience-deepening, appreciating their situation and trying to make something that will make their life more meaningful. 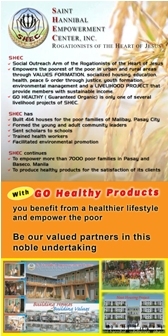 SHEC aims to make the people appreciate whatever they have. It is in doing so that they will approximate what they can share in the near future. They can only give if they have something. Further objectives are the following: to appreciate the fruits of prayer, to give value to meditation, rosaries, prayer for vocations and to appreciate the dynamics of leadership trainings and management activities. Out of the indicators set forth, it would be easier to determine how well the people and leaders have appreciated whatever has been imparted to them. These indicators can be that of having memorized the important insights about the kingdom of God, prayers, community organizing,� leadership trainings and values formation. Other indicators can be the land titles for those who have already availed of the housing programs. Increase in their salaries also serve as their indicators for those who been employed. Such can be put to action only when there are regular activities like seminars, recollections, leadership trainings and other related activities that boost the personality and capacity of the leaders. �4th- Sharing means offering something to others according to their own capacities and their members, spending quality time with those who are in need of assistance too. 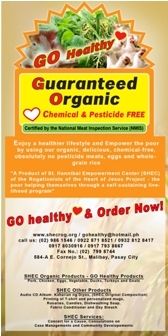 SHEC wishes that it can create in people that same desire of sharing to others responsibly whatever they have received. At the core of the vision of SHEC is the Kingdom of God. Central to this is the proclamation of the justice to the poor. Sharing time, talent, skills, knowledge and proper attitude and helping the other poor is also proclaiming justice. Thus, sharing is found at the heart of SHEC. After receiving inputs from the trainings and from their experiences in the group formation and dynamics, it is high time for the leaders to share what they have to the rest of their members.� Thus, the objectives can be defined as follows: to teach to others the art and practice of prayer, meditation and rosary.� This strategy also aims to let the leaders share their learning to their members especially about the importance of the proclamation of the kingdom of God. To be more practical, the leaders are expected to share their notion about the different programs on housing, livelihood, education and other learning they imbibed during the course of trainings. All these things can transpire only when there are interactions between the leaders and the members. Some other activities like seminars, symposia and recollections are also part of the process. At this point in time, the main facilitators are the leaders. The SHEC staff and other program coordinators will just serve a guide along the course of the learning experience. ����������� The process that is adopted in these strategies is characterized by graduality, adaptability and chronology. By graduality, it means that the process goes along with the capacity of the SHHOAs; adaptability, goes with the proper pacing of the activities; chronology, one follows the other strategy over time. This means that the SHHOAs are assisted to proceed to a higher level one at a time depending on the level to which they belong. ����������� These five S�s are summed up into a single strategy called Spirit-Nourishing Strategy (SNS). This means that starting with the people is actually making them become open to the Spirit of God. Making them move, letting them value their situations and lives, sharing with others whatever they received is making the Spirit become more active in their life. In this way, the Spirit is nourished in their life. ����������� Such strategies are preceded by several objectives, key result areas and performance indicators per two quarters of the year. When the strategies are indicated, the programs and activities follow right after. It is expected that at the end of all the undertakings, all the SHHOAs will reach level five in a given period. ����������� One way to prove the legitimacy of such strategies is by putting them in parallel with the Community Building Approach (CBA) of SHEC. The following table shows the parallel activities between CBA and the strategies, thus showing the link as explained thereafter. -preparing them to be aware of the presence of God in their lives and the ways to get closer to God. - inspiring them to go deeper in their knowledge, skills and attitude about their own concerns and the values developed by them. -Appreciating their situation and trying to make something that will make their life more meaningful. -developing the habit of assisting spontaneously those in agony and making the people stand on their own. The CBA has been conceptualized at the start of the project in Pasay. This is the way SHEC envisions and actualizes its approach in building the communities. The SNS, on the other hand, came into existence only after the poor have been organized in order to address their specific needs due their differences. Both BCA and SNS are means to address the needs of the communities. They are intended to improve the lives of the people. At one point, CBA is more general in terms of addressing the needs of the people and SHEC. The SHEC staffs prepare the people to be on their own. They engage them in the community undertaking. On another point, the SNS are more detailed because they speak in particular terms the way the different homeowners� associations strive to be empowered. The approach is progressive, meaning, one step follows another. The link between them is the fact that both speak of the same thing, that is, empowerment of the poor. They follow a certain sequence. They start with knowing the people; capacitating them, leaving the people when they can already stand by themselves and ready to be sustainable for development. CBA and SNS are mostly initiated by SHEC but with the participation of the people. This is attested by the first steps of community building such as immersion and setting off stage. The end point of all these endeavors is making the people become more and more capacitated in terms of knowledge, skills, and attitudes. The CBA and SNS happen at the same time but in this case, CBA came ahead of the other. In point of fact, it started way back in 1998. It is only in these months that the Spirit-nourishing strategies have been planned and realized. Thus, although, they did not come at the same time, the process is this same. Another link is seen in the locus of their operation. Both strategies and approaches happen in the community of the poor. These become the natural place of empowering the people. The success of the implementation of the strategies for the SHHOAs and the stakeholders largely depends on the efficiency and efficacy of SHEC. Given this reality, SHEC now looks more intently into itself in order to know what strategy is needed. The overall strategy is called Spirit-living. The Spirit is the God that counsels, inspires and motivates the inner life of people. Living the Spirit, in this context, means making the inner self become improved and active in order to be one with the Spirit. This is verily at the core of the vision of SHEC, which is to be intimately united with God the Father. Thus, to live the Spirit is to make the internal environment improved. Spirit-living, as a strategy, is formulated based on the result of the SWOT analysis. It is therefore employed as response to the pitiable condition of the poor and the diminishing capacity of SHEC in assisting them. This is based on the vision-mission of SHEC. This is the venue where all the activities of the different strategies are placed. Such plans are needed in order to ensure that the activities will be implemented; highlights, noted; status, checked; in charge, identified.� There will be two levels. The factors which highly influence the success of the empowerment are the assumptions.� They can facilitate in the development of the SHHOAs in collaboration with SHEC and with all its partners in bringing about the best in the people. While it is noteworthy to exhibit the assumptions, it is also equally important to present the potential risks in order to prepare for the apropos method to address them. In the end, the mitigating elements are put forward to brace one against the untoward events. �� �In the first place, the government officials are supportive of the activities of SHEC and the SHHOAs in the implementation of the projects. Likewise, the Church continues to support SHEC in carrying out of its role in the evangelization of the poor. In addition, the private groups are constantly extending their assistance whatsoever in helping SHEC in all its programs. Despite some problems, still the Rogationists extend support to the management of SHEC in order to carry out its responsibility in caring for the poor and in promoting the prayer for vocations. Fortunately, the SHEC management survives all the problems being encountered right now especially those which pertain to financial viability and sustainability. Besides, those in SHEC are actively involved in the programs of the poor. In the end, the organized SHHOAs remain active in collaborating with SHEC in order to implement the plans which have already been prepared earlier. �� �Behind the success of the endeavor of empowerment, potential budding negative elements are seen, like in the following:�� The civil case is pursued by the recalcitrants against the management of SHEC and the leaders of the SHHOA, Phase 1. Moreover, Barangay !57 prevents its residents to avail of the programs of the SHHOAs. Also, the local government unit can not decide which party to support especially when the opponents of the SHHOAs are pleading for his support to nullify the programs of SHEC. In addition, some private groups cease to extend their support to SHEC. In the same way, some Rogationists remain callous to the initiatives of SHEC in caring for the poor. They undermine the activities being undertaken. Out of the desire to complete as soon as possible the ongoing projects, some of the staff and personnel of SHEC are overloaded with works. Another potential risk is that when something wrong happens to the priests who are assigned in SHEC. Finally, everything falls apart when the SHHOAs do not want to pursue the development process anymore. 1.�� �Recourse to the civil court is needed in order to address the concerns of those who are against the programs and projects of SHEC. 2.�� �Support of some lawyers is needed to defend the rights of the SHHOAs in organizing and promoting their own welfare in the face of the opposition parties. 3.�� �The office of the Mayor has to be decisive in its support to the SHHOAs. 4.�� �The private groups have to be encouraged to partake in the activities of SHEC and of the SHHOAs. 5.�� �To make the Rogationists feel that working with the poor is an essential part of their charism, they should be more actively involved in the process of empowering the poor. 6.�� �The SHEC personnel are protected from all potential harm that might be hurled against them. 7.�� �The passive members of the SHHOAs are given means to move along and are made active participants in the process of empowerment. The success of the community building process and the strategies employed to assist the SHHOAs and the management of SHEC largely depends on the joint effort of all major stakeholders. But above all, this comes to fruition only when everyone is guided and led by the Spirit in pursuit of the long lasting personal and community development.